Imperial Garden is an award-winning, authentic Chinese Restaurant which opened its doors in 1987 as the original Chinese Restaurant in the Triangle area. Our famous Raleigh restaurant is located at 7713 Lead Mine Rd in North Raleigh at Greystone Village. At Imperial Garden, you'll find some of the best authentic Chinese food in the area for both lunch and dinner. Plus, you won't want to miss our delicious Chinese buffet at lunch on Sundays. We offer family-style dinners, vegetarian dishes and customized meals, in addition to classic dishes. We have seating both indoors and outdoors, and offer a popular beer and wine menu. Dine in and enjoy live piano music Tuesday through Sunday from 6-9 PM and during lunch Sunday's from 11:30-2PM. 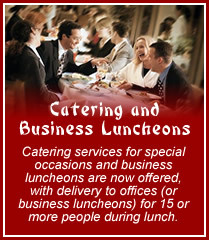 Catering services for special occasions and business luncheons are now offered, with delivery to offices (or business luncheons) for 15 or more people during lunch hours.